The Colorado Department of Transportation (CDOT) is reminding drivers to brush off their winter driving hats and prepare for snowy conditions Sunday. Winter weather and winter driving will be back in full swing before we know it and we will all be better off if we take time to prepare. CDOT crews are ready to remove snow and ice from state-maintained roadways this weekend. While it will be mostly dry on Saturday, precipitation is expected to move in Saturday evening with flurries starting soon after in north central and northeastern Colorado. The Denver/metro area will start to see snow early in the morning on Sunday with the snow storm continuing south. Motorists should expect snow and freezing temperatures to last through most of the day Sunday, especially in southern Colorado. CDOT expects there to be slushy road conditions and are prepared to have maintenance crews in place to prevent it from turning to ice. Motorists should also anticipate icy spots in the high country. Even with treated pavement, there could still be slick conditions and it does not take much for spin-outs to occur. CDOT crews will be on rotating 12-hour shifts and will work around the clock until the snow ends and roads are in good shape. Crews will continuously remove snow and treat roads, with interstates as the first priority. Worn tires can't grip the road well and can be extremely hazardous. Check your tires by preforming the Quarter Test. Insert a quarter into the tire tread upside down, with Washington's head going in first; if the top of George's head is covered by the tread, your tires are OK (do this test in multiple points around each tire). If the top of his head is visible at any point, you need new tires. Invest in safety by getting a set of snow tires. 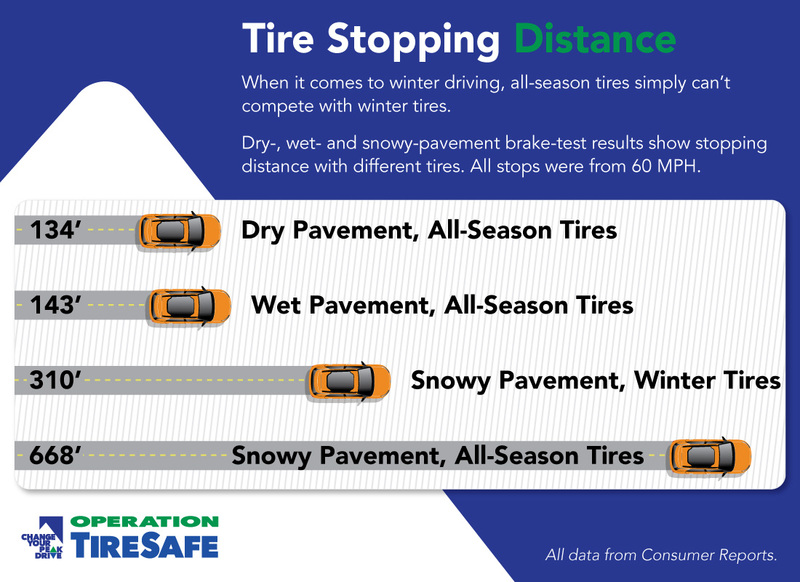 When it comes to stopping safely on snow and ice, all-season tires simply don't compare to winter tires (see chart below). If your tires don't have at least a one-eighth inch tread when a Traction Law is called, you are in violation of the law and could end up with a fine. Leave extra room between your vehicle and others on the road at all times. Even vehicles with four-wheel/all-wheel drive will not stop any quicker on icy roads, especially if you have inadequate tires. In poor visibility, don't drive faster than you can see ahead. High speeds in poor visibility can lead to dangerous chain reactions. Snow plows need space to work, so unless you want to cause a crash, delays or be stuck on a snow-covered road, don't crowd the plow! If you must pass a snowplow, do so on the left and with extreme caution. Check Goi70.com to see travel forecasts for the I-70 mountain corridor, road updates, rideshare and parking information, deals on lodging, food and entertainment for travelers and more. Remember to avoid peak travel times whenever possible and consider carpooling or alternative transportation. If you are stuck in a serious storm, do not leave your car. Run the engine periodically and wait for help. Prepare a winter driving vehicle kit. Carry blankets, water, a flashlight, a shovel, some nutrition bars or other food for sustenance. 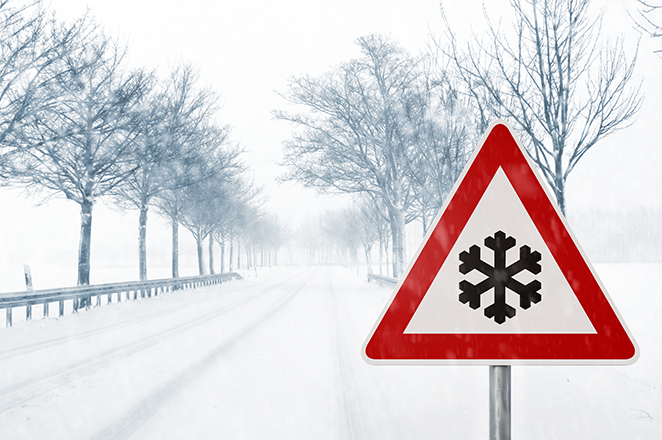 Winterize your vehicle's safety kit by including extra blankets, sand to help gain traction in the event you become stuck on ice or snow, jumper cables and an ice scraper. Additionally, all motorists should be familiar with Colorado's Passenger Vehicle Traction Law and Passenger Vehicle Chain Law. These laws are implemented when weather and road conditions require it, at which time highway signage will be activated to alert drivers. Traction Law -- When the Traction Law is in effect, motorists must have snow tires, tires with mud/snow (M/S) designation, or a four-wheel/all-wheel drive vehicle -- all tires must have a minimum one-eighth inch tread. Passenger Vehicle Chain Law -- Reserved for severe winter conditions as the final safety measure before an interstate is closed, the Passenger Vehicle Chain Law states that every vehicle on the roadway must have chains or an alternative traction device (like AutoSock). Without proper equipment, you can be fined $130. If your vehicle blocks the roadway, you could be fined more than $650.